Click asterisks for YouTube video of song. Notes and Resources Below. We love these music lessons focused on participation provided by an AO mom with a music teaching background: Children of the Open Air. Included are Solfa lessons for musical literacy and basic singing lessons. American Folk Songs for Children, by Mike and Peggy Seeger (a long time favorite; there are two bloodthirsty ones which we skip). Michael Card's "Star Kindlers" album utilizes very old Celtic tunes. Music lessons focused on participation provided by an AO mom with a music teaching background: Children of the Open Air. Included are Solfa lessons for musical literacy and basic singing lessons. AmblesideOnline schedules these song rotations as a group to facilitate our Artist, Composer, Plutarch, Shakespeare, Folksongs and Hymns studies through sharing resources and experiences on the list. Songs are asterisked * with links to videos at YouTube. These are suggestions. You may find something that works better for your family. We hope you will want to share your ideas with the list so that we all may benefit as we continue to improve the curriculum. You can go to the websites listed, gather your family around the computer and have an old-fashioned family sing, 21st century style. This is surprisingly enjoyable. You can copy the lyrics onto a word processing file and print them out, creating your own family song book. You could put these in peechee folders (cardboard folders with three prongs in the center). This makes the activity more portable. You could have sing alongs in the car, on camping trips, and cuddled up on Mom's bed. Of course, you'd have to first gain some familiarity with the tunes to do this, but folksongs generally have pretty memorable melodies. You can save the midi files to disk. There are instructions on the Contemplator's website for doing this with some computers. If you have a Mac then you would need to find somebody else to help you, or you may be able to be the helper. Try to sing the tune for each term at least three times a week. Daily is ideal, but we cannot all be ideal. The above tunes are chosen as a service to you, our users. They are not meant to be definitive. We chose them as we did so that each family could be on the same page in music, no matter how widespread the ages of the children. In choosing songs, we strove to include folk songs of America, Canada, Ireland, Scotland, Wales, and Australia, songs that would be of general interest, and tunes that were not too difficult to sing. This list falls short of a Charlotte Mason Education. Miss Mason used more than one folk song per term. She also coordinated the folk songs with history and geography study. There are many wonderful songs that would enhance our history studies. It would be a shame, for example, to study Bonnie Prince Charlie and his fight for the throne without also learning songs like "Speed Bonnie Boat..."
In addition to using folksongs in history and geography studies, Miss Mason used them in language studies. While studying French, for example, her students would also learn a traditional folk song of France--in French, not an English translation. http://ingeb.org/home.html is one resource you might use for adding foreign language folk songs to your studies. None of us have had time to give this a comprehensive look, but it does appear useful. We would like to hear of any other resources or materials. Keep the above websites handy. There are some fascinating songs about various historical battles, and they would so enrich the lessons. There's a very funny one about Lord Peter Parker getting his pants shot off in, iirc, one of the Revolutionary battles. Apparently, this is quite literal, he did. I can just picture hoards of little boys singing this one with glee and wanting to know more about that battle. As we go through each term, we hope that we can all work together to find folksongs that fit with each year's course of study (there are many songs about Robin Hood, for example, that would be fun for those reading Howard Pyle's Robin Hood). We'd like to have around three folksongs per term. These are, of course, optional. It's not our intent to burden homeschooling moms, but to add a little joy and life to their studies. We hope the songs are fun. 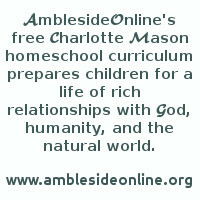 The easy answer is that AmblesideOnline's foremost goal is to be as representative of Charlotte Mason's ideas, philosophies, and practices as possible. This is what defines us. Note, please, that doesn't mean we've ever thought we arrived, or were somehow superior to everybody else, or were the Charlotte Mason experts. Somebody will always know more than we do, and we hope never to stop learning.=) But that's our goal, to set forth a program that shows what a CM education might actually look like if it were as close as possible to what CM did--not because we idolize her, but because we think that's the fairest test of her methods. Miss Mason used folksongs in her programs, so AmblesideOnline, in an effort to give those methods the fullest and fairest demonstration, has folksongs as well. But that's not all there is to say about folksongs. There is a wealth of rich material in folksongs. There are songs about historical and mythical characters, there are songs that go with the history we study in school, there are songs that, like the poetry of the day, give the feel and flavor of the time or culture--a very important goal in a CM education. Folksongs do this in a unique and special way. I've mentioned before that when reading about CM, I find it helpful to take about three steps--the first one is simply to ascertain exactly what CM said or did--just the facts, ma'am, just the facts. Only after I am quite sure I know the bare bones facts, I think about why, the principles involved. In this case, I think it's helpful to remember that what we call a 'CM'education is really just a 'liberal education' (liberal, meaning generous, wide, extensive, broad, bountiful, rich). It is not educating for utilitarian purposes (utilitarian meaning limited to what we might need to know to perform a job for income). We are educating our children for themselves, for their entire lives, to enrich every area of their lives, to give them broad vistas, to enrich their lives as adults in many areas. Folk songs are one part of a liberal education. Besides giving us some feel for the time and culture they represent, they are fun to sing. Developed by the people for the people, they are singable, useful for delight and enrichment in the bathtub, in the shower, while rocking a baby to sleep, traveling in a car, washing dishes, cleaning out the car. They are accessable to all of us--no externals necessary (no instruments, no lessons, no accompaniment required). More of us should sing, and if we start this when our children are young, then when they are grown, they will feel comfortable with their own voices. Which brings me to the next step I find helpful--after figuring out the principle behind the fact, I can think about how I might follow that same principle today. In this case, folksongs are folksongs. I don't think modern children's songs are a substitute, because then we'd miss the historical aspect. However, the folksongs listed in the curriculum are there as a service, not a requirement. Other folksongs may freely be substituted to accomplish the same thing. This is Lorraine's response to the same question, "What is the value of folksongs?" In a world which is becoming increasingly focused on being entertained, singing folksongs together can help people to realize the richness of simply singing together as a community. Singing hymns can do this, but it can lead one to think of music as purely spiritual, instead of being an expression of joy and peace and contentment in the heart and soul (or an expression of grief as need be - there is a time and season for both emotional experiences, thus there is a time and season for both types of music, and a gamut of other musical expressions as well). The historical look into African American folksongs can help people understand the feelings of the African American issues more poignantly than even stories. Music goes deep to the soul. The historical look into the struggles in old England (or any other country), the joys, the cautions taught via music, the silly tales told for fun and/or to teach the heart or mind . . . these help us to realize how people used to think. Old war songs teach so much more than any textbook and sometimes can quickly teach ideas which just about can't even be expressed in the great HEO/AO selections. Considering why the colonies made up their own words to The British Grenadier, and considering why the South made up new words to "Northern" songs also gives one moment to pause and catch a glimpse into hearts. You might look at this fun song; it can show you one song used as a funny 'lesson' sort of song. You might check out various folksong books from your library system (if you are blessed as we are) and read through them as a living book. You might be touched and surprised at what brings tears, teaches more depth to history, makes you laugh out loud, makes you want to sing, and so on. And better than that, you can share those experiences with your family via the shared, expressive art of singing together. The need to listen to each other in order to end a song more slowly at the end, or to markedly cut off a given word to make a 'marcato' emphasis, or etc. teaches attention to each other's voices. Listening to each other can be more of a focus more readily when depth of theology isn't the bigger point . . . at least, from my experience. Not that it isn't valuable to transfer that skill over to worship music. That's not an exhaustive list of reasons, but perhaps it might be enough to help you take the plunge. Children's songs do include folk music, but folk music is much more rich than children's music overall. Okay, here's one last example: If you were to play a simple guitar accompaniment (or a simple accompaniment using some other stringed instrument), you might be struck with a depth of awe at the intense beauty of a simple children's song . . . assuming here, that it is a classic folk song quality song. If you take away the simplicity of the words, the music says so much more than we realize, and often, we don't give the music credit and respect for its lovely power and beauty, much as we assume a child is not old enough to access rich ideas. So we don't sing a song that we think is too simple in such a way that its richness and depth can touch us to the core. But if you really slow down and sing together, feeling a song that can be sung loudly and on the march, but then feeling that same song in a quiet way . . . ? Such an experience can teach so much, and hymns can do that sort of thing, but folksongs are typically more accessible for that sort of experience. Then, taking that same experience, and singing a hymn in various 'moods' and 'timbres' . . . It's utterly shocking. If one goes through some of the psalms set as poetry (psalter readings), such as those here and listens/sings that text to various hymn settings, one can be yet again astonished at the power that a change in melody can make on the emphasis of heart behind each given singing/setting of the given psalm. Again, it is experienced easily enough via hymns, but doing so with folksongs has a richness of its own.